Due to an Israeli blockade, the Gaza Strip’s roughly 2 million inhabitants have been subjected to poverty and hardship. 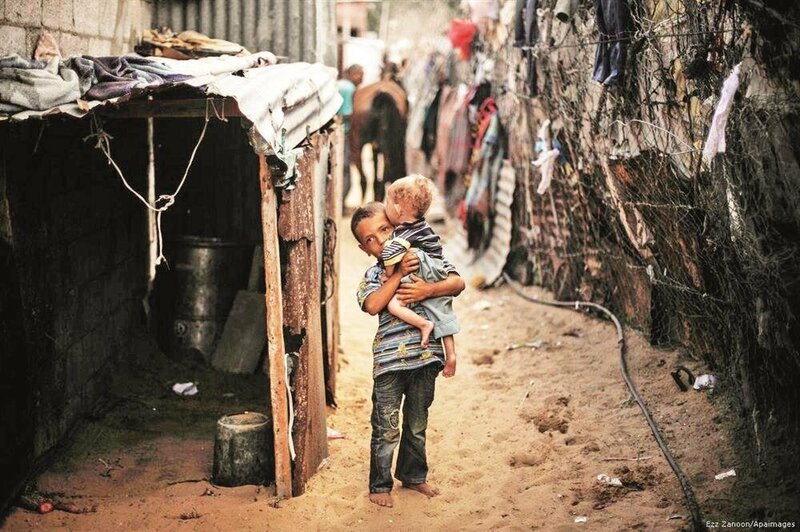 In a report released by the Palestinian Central Bureau of Statistics, the percentage of poverty was 13.9 percent in the West Bank, while it reached more than half of thr population in Gaza Strip with 53 percent. 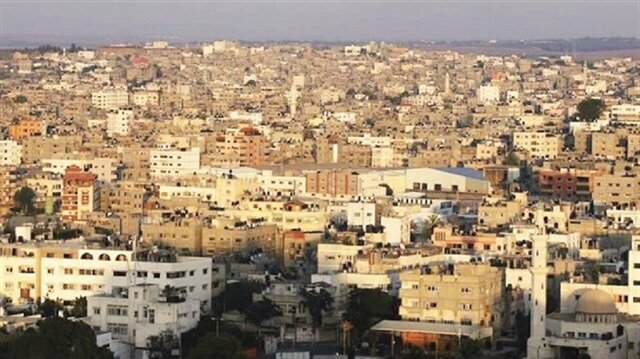 The rate of unemployment in Gaza reached 44 percent. This figure soars up to 60 percent among young university graduates. The economy of Gaza, whose population has risen by 38 percent in the past decade, has grown by just 1.44 percent. The poverty percentages were 25.8 percent in 2011 while it increased by 13.2 percent in 2017 to reach 29.2 percent of individuals were below the poverty line. The UN’s Office for the Coordination of Humanitarian Affairs, meanwhile, has reported that -- as of the end of 2016 -- 1.3 million Gazans depended on international aid in order to survive, while 47 percent of families in Gaza lacked access to secure food supplies. Dozens of Palestinian vehicles were vandalized Tuesday morning in a suspected “price tag” attack by Jewish settlers in the Israeli-occupied West Bank, according to a Palestinian official. “Israeli settlers vandalized about 30 vehicles at dawn today in the villages of Assawyia and Lobban near the West Bank city of Nablus,” Ghassan Daghlas, a Palestinian official in charge of the Israeli settlement file, told Anadolu Agency. “Vehicles had their tires slashed and their windshields smashed and were spray-painted with anti-Arab and anti-Muslim slogans,” Daghlas said.“Settlers also tried to attack local mosques but were prevented from doing so by villagers,” he added. So-called “price tag” vandalism is a strategy employed by extremist Jewish settlers by which they attack Palestinians and their property in ostensible “retaliation” for perceived threats to Israeli settlement expansion. In a related development, the Israeli army reportedly detained eight Palestinians in overnight raids carried out across the occupied West Bank late Monday night. “Five Palestinians were arrested after their homes were raided in the city of Qalqilya,” the Palestinian Prisoners’ Society, an NGO, said in a statement. “Three others, meanwhile, were arrested in the cities of Ramallah, Nablus and Jenin,” the statement added. According to Palestinian figures, some 6,500 Palestinians are currently being held in Israeli prisons, including dozens of women and scores of minors. Roughly 500 of these are being held without trial or charge under what Israel calls "administrative detention". The Israeli army frequently carries out sweeping arrest campaigns across the West Bank on the pretext of searching for "wanted" Palestinians. Gaza Strip locals rely on a sophisticated network of cross-border tunnels to import basic commodities, including food, fuel, and medicine as a result of the Israeli blockade. Under the 1993 Oslo Accords between Israel and the Palestinian Authority, Gazan fishermen were given the right to ply to their trade up to 20 miles off Gaza’s shoreline. This, however, was recently reduced by the Israeli authorities to a mere nine miles. As a result of the dire circumstances, Gazan locals rely on the aid provided by the UN, however a portion of this has been suspended. The U.S. recently decided to withhold $65 million in aid to the UN Relief and Works Agency for Palestinian Refugees (UNRWA) following President Donald Trump’s decision last year to recognize Jerusalem as Israel’s capital. Experts attribute the worsening situation to declining business activity and local production as a direct result of the Israeli blockade. A chronic electricity shortfall, caused by the siege, has contributed largely to declining production, which in turn has forced numerous businesses to halt operations. Gazan siblings, who are amputated waist down, were brought to Turkey for treatment on Tuesday. The siblings were born with a congenital amputation and could not be treated in Gaza due to medical complications.Secud, 9, Mahmud, 7, and Enes, who is only 9 months old, were welcomed along with their family by Turkish Health Ministry officials at the Esenboga Airport in the capital Ankara.The brothers were brought to the city following instructions by Health Minister Ahmet Demircan, who saw their photograph at a contest organized by Anadolu Agency.The picture titled "Life of disabled siblings" was taken by Ali Jadallah.The family was assured that the brothers will be provided the best treatment in Turkey.Due to an Israeli blockade, the Gaza Strip’s roughly 2 million inhabitants have come to rely on a sophisticated network of cross-border tunnels to import basic commodities, including food, fuel, and medicine. The Israeli army has imposed a four-day closure on both the occupied West Bank and the blockaded Gaza Strip ahead of planned celebrations marking the 70th anniversary of Israel’s establishment, which began on Monday and will continue until mid-May.According to an army statement, the closure began on midnight Sunday and will continue until midnight Friday.The Israeli authorities typically lock down the occupied West Bank during Jewish holidays.It is the first time, however, for the army to seal the West Bank and Gaza for national anniversary celebrations.According to the army statement, the closure means Palestinians from the West Bank will be barred from entering Israel while the limited import of goods into the Gaza Strip -- including fuel -- will be temporarily halted.The move comes amid mounting tension amid plans by the U.S. to move its embassy from Tel Aviv to Jerusalem on May 14.That day will mark the 70th anniversary of Israel's establishment in 1948, when hundreds of thousands of Palestinians were dispossessed of their land to make way for the new Jewish state.The Palestinian territories have remained tense since last December, when U.S. President Donald Trump recognized Jerusalem as Israel’s capital, drawing condemnation and protest from across the Arab and Muslim world.Ever since, Palestinians in the West Bank have held rallies each Friday -- which often lead to clashes with Israeli forces -- to protest the controversial U.S. decision.Meanwhile, in the Gaza Strip, Palestinians are holding continuous sit-ins along the strip’s eastern border with Israel to demand the “right of return” to their ancestral homes in historical Palestine.Since the “Great Return March” began on Mar. 30, at least 35 Palestinians have been killed -- and thousands more injured -- by cross-border Israeli army gunfire.In a related development, the Israeli army rounded up 30 Palestinians in overnight raids carried out across the West Bank, according to an army statement issued Monday.The individuals were arrested for suspected involvement in “popular activities affecting security”, the statement read, going on to note that they had all since been referred to the authorities for investigation.According to Palestinian figures, some 6,400 Palestinians are currently languishing in Israeli prisons, including dozens of women and scores of minors.About 450 of these are under what Israel calls “administrative detention” in which they receive neither trial or charge.The Israeli army frequently carries out sweeping arrest campaigns across the occupied West Bank under the pretext of searching for "wanted" Palestinians. Three Palestinians were wounded along the Gaza Strip's eastern border by Israeli soldiers during peaceful protests against Israel’s decades-long occupation, the Palestinian Health Ministry said late Sunday.Spokesman Ashraf al-Qidra said the wounded Palestinians were taken to the hospital for treatment.At least 35 Palestinians have been martyred and more than 3,000 wounded by Israeli army gunfire since the most recent round of demonstrations began on March 30.The rallies are part of a six weeks of demonstrations that will culminate on May 15. That day will mark the 70th anniversary of Israel's establishment -- an event Palestinians refer to as the "Nakba" or "Catastrophe. "Demonstrators demand that Palestinian refugees be granted the "right of return" to their towns and villages in historical Palestine from which they were driven in 1948 to make way for the new state of Israel. An explosion in the southern Gaza Strip killed at least two Palestinians on Saturday, the local health ministry said.Medics at the site of the explosion had said three people were killed but officials confirmed only two deaths.Residents said the explosion was caused by an Israeli attack. An Israeli military spokeswoman had no immediate comment.